Robots are steadily changing from large industrial robots to more compact and user-friendly collaborative robots in the production line. Some of the recent innovations in this segment include Universal Robots’ e-Series, ‘KR-Cobots’ by Kassow Robots and KUKA’s iisy cobot. The robots are coming! And they are here to stay. The global manufacturing industry is slowly transforming from a labour dominated market to an automation driven robotics one. The reason for this change: Increased productivity, greater efficiency, shorter cycle times and utmost accuracy. The global robotics industry is still evolving and so are the features of its robots and the manner in which it interacts. Industrial robots have existed in the market since decades and are capable of carrying out tasks such as welding, painting, assembly, pick and place, packaging, labelling, product inspection and other similar functions in the production line. In recent times, the next ‘big phenomenon’ are cobots, also called collaborative robots. Cobots are user-friendly and act as great mediums to eliminate the barrier between man and machines. This means that cobots and personnel can work besides each other on the same shop floor and carry out the required tasks without worrying about any danger. Human robot collaboration is now trending! 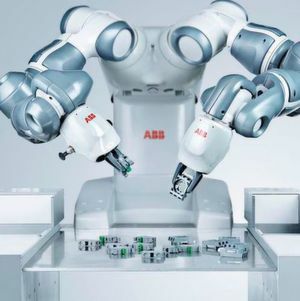 Some of the recently introduced cobots in the market include Universal Robots’ e-Series which is equipped with intuitive programming, versatile use and an unsaturated list of addons. The quick to install cobot increases productivity of the process line irrespective of the firm’s product and company size. 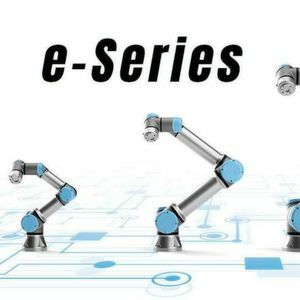 The e-Series is segmented into three cobots namely the UR3e, UR5e and the UR10e. The small UR3e cobot has a payload of 3 kg and carries out high precision tasks along with light assembly tasks with ease. The cobot’s wrists also move in a360 degree rotation. Next is the medium sized UR5e which has a payload of 5 kg and suits best for automating low-weight processing tasks. Lastly, the UR10e is capable of automating tasks of up to 10 kg and can carry out functions such as packaging and palletizing. Market scenario The rise of cobots!